Bramerton was our last port of call on a day in early February. It was already half past four, and the day's low cloud meant the light was now fading fast, thinning out into monochrome. However, we were not too late to find St Peter open, or to capture the idiosyncracy of the tower. 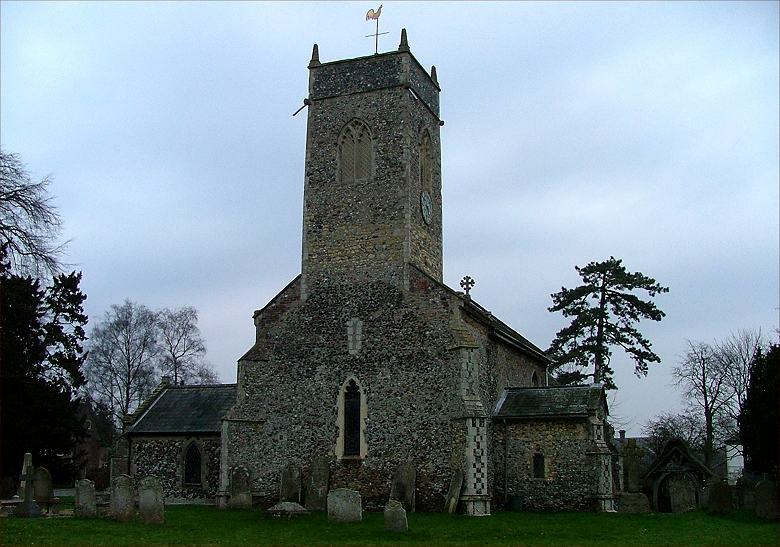 As at Thurton, it is too small for the church against which it stands. Unlike Thurton, the space beneath the tower here has been extended out sideways to form transepts, and there are elaborate traceried altar squints from these transepts into the body of the nave. It is very curious. Looking at the photograph at the top, I did wonder if St Peter had once been a cruciform church, but I think the grey flint area is merely the base of a former tower. There is a delightful red brick Tudor priest door, and in general you might think this church mainly the work of the century before that, but to step inside is to enter a building that is now almost entirely Victorian inside, a medieval shell containing a 19th century Tractarian church. I don't know how busy this parish is, but the great lump of the font still had the nativity crib scene on it. Perhaps nobody had noticed - it was so dark inside. DD looked for the lights, but the cupboard was locked, so we had to accustom ourselves to the darkness, and feel our way by flash, so to speak. The chancel with its austere reredos and deep windows overwhelms everything, and is very much of its age. I found it interesting that the glass matches the painting of the pipe organ at the west end. A north transept was part of the restoration, and the deeply coloured glass gave it a real 19th century atmosphere. The woodwork, of course, was all renewed, but it is not without interest (at least, to me - DD scoffed a bit). They have incorporated ironwork into the tops of the bench ends for candles, and also a couple of poppyheads, one of which I am sure is old - it bears two double-headed eagles back to back, and the top of the piece has a candle prick. I found it intriguing, but I'd have to go back on a brighter day to be sure of it.